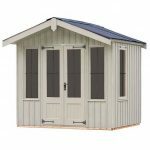 Those who want a really high end small summer house in to rest after a hard day at work, or just to have a spot to chill out in on weekends, will love the Strongman 6ft x 8ft Alpine Tanalised Summerhouse. 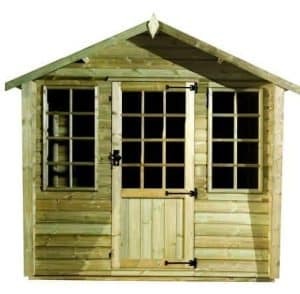 This really is one of the most high end smaller sized summerhouses you can get. It has a fantastic style to it that manages to be modern and sleek, but at the same time thanks to the fixtures on the door and the window frames. Also have something of a classic and old school look to it as well. You can tell from the first look that this really is one classy and well made summerhouse. The materials used to construct this summerhouse are just first rate all the way. The wood has undergone a tanalised pressure treatment process which makes it some of the strongest and most long lasting wood you can get. 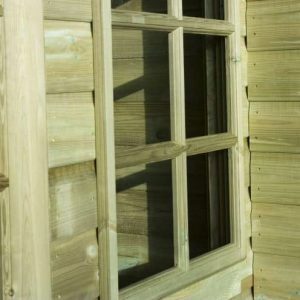 The cladding is a very impressive 19 mm thick and inside the summerhouse is one of the largest frames you can get on a summerhouse of this size. Even the roof and floor are made with high quality boarding that as well as being strong also goes great with the look of the rest of the summerhouse. Today we are looking at the Strongman 6ft x 8ft Alpine Tanalised Summerhouse which is one of the most high end small summer houses we have come across. 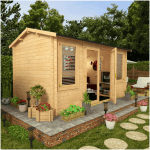 If you do not have a lot of room in your garden, but want to get the very best small summer house possible then this one could be for you. 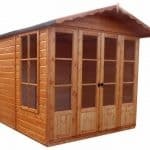 The width is 7 feet 7 inches and the depth is 5 feet 7 inches so as far as more compact sized summerhouses go this one here is one of the slightly larger ones. The wood used for this summerhouses is tanalised alpine which is one of the most impressive pressure treatment process wood can go through. It is also a major reason as to why the price is what it is. They do not give the exact dimensions, but you can clearly see that there is a nice amount of headroom in here. The ridge is high and the eaves also look to be on the high side as well. The roof is just as high quality as the rest of the summerhouse. If you look really closely you can see that it is made from strong timber boarding. This is not just great because it can take the weight of the heaviest snow fall, but we also love the way this looks. It really does go very well with the rest of the summerhouse. Protecting these lovely wooden boards is some black mineral felt which will keep the rain at bay. The roof also have a good sized overhang which will help give the front of the summerhouse a little bit of shielding from the rain. We just love the cladding that has been used for the Strongman 6ft x 8ft Alpine Tanalised Summerhouse. It is tongue and groove shiplap cladding, but rather than be 12 mm thick like standard, they have gone that extra mile and used 19 mm thick cladding. When you add to this the fact the wood has been tanalised, you not only have cladding that looks amazing, it is also ready to deal with anything the weather can throw at it. To ensure that this is one very robust small summer house, a thick, chunky and very strong 63 mm x 38 mm frame has been used. 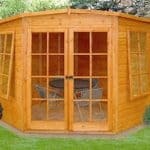 Off the top of our heads, we cannot think of another smaller sized summerhouse that has a frame as strong as this. The cladding along with this frame will really make sure you get 20 or more years out of this. The floor is made up of those same solid boards that the roof is and they just mesh so well with the cladding. The floor is going to be able to take a whole lot of weight and it is going to feel solid under your feet. Sometimes cheaper boarding can feel a little bouncy, you will not have that issue with this kind of flooring. The style of these boards also goes well with the cladding and helps give the inside a very uniform look. The tanalised pressure treatment process the wood undergoes makes this wood able to fight off rot and decay and also any insects that might like the look of it. There is no better equipped wood for taking on our British weather and bugs than this. 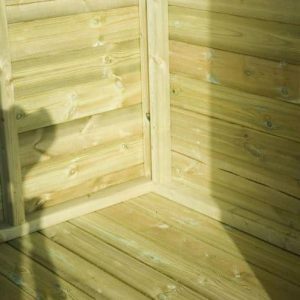 A huge bonus of this tanalised pressure treatment process is that it means you can spend more time inside the summerhouse, relaxing and less time covering it with wood treatment. 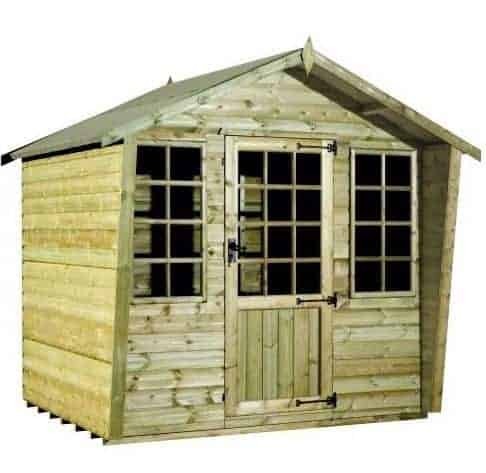 The Strongman 6ft x 8ft Alpine Tanalised Summerhouse comes with a 15 year anti rot guarantee which we feel is very generous. The door on here is one of the best we have seen on any small summer house. It may be a single door, but it just has so much personality. The door is mainly made up with high quality cladding, but there is a very nice window that has some classy looking framing around it. The door is finished off with some black, antique style hinges that really do help give the front of the summerhouse a very high quality and expensive look. At each side of the door there is a large glass window which again has some very nice framing to give it a bit more personality. These are some good sized windows so plenty of light is going to get in through the front of the summerhouse. We do though feel that at this price range at least one other window should have been added to one of the sides. The high quality extends to the security as they have included a very old school looking lever lock and mortice lock. So no matter what you put inside here, you can be confident it is going to be kept safe. With how robust the whole structure is, we feel that this is one of the stronger small summer houses we have seen. With the framing on the windows and the fact they are all on the front, you do get quite a bit of privacy with this summerhouse, especially if you were to face it away from peeking eyes. The Strongman 6ft x 8ft Alpine Tanalised Summerhouse just looks fantastic the way it is and to be honest we would not change a thing. It seems that they feel the same way as there is not any customisation options at all offered with this. There are a couple of extras that you may want to consider. First of all is a security hasp and padlock set which is only £4.99 and would give you that little bit extra security. Also if you want to make the floor even stronger or are just a little concerned about the area you are installing this on. Then they have a Pro Shed Base for the reasonable price of £49.99. We are not exaggerating here when we give this 10/10 for quality. They have done an incredible job from the bottom to the top. Even 20 or more years from the day of installation, you will be able to enjoy this summerhouse. They have only used the best materials for this and while it may raise the price, it also means it is going to give you a lifetime of use. 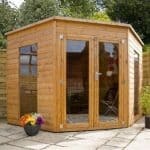 Despite being one of the most high quality compact sized summerhouses, it is still going to require some clever planning on your part to make the most of the space available. This is a two person job, but it should not cause you any major problems. 6-8 hours is the time they suggest and we would agree with that. Just be sure to always have the kettle and biscuit tin on standby. Look this summerhouse is amazing, but at the same time it is a smaller sized summerhouse and at a similar price point, we have seen some summerhouses that offer as much as twice the floor space as this. Final Thoughts: We feel that it is pretty much impossible not to be impressed by the Strongman 6ft x 8ft Alpine Tanalised Summerhouse. Everything about this small summer house is high quality. They really have done an incredible job with this. 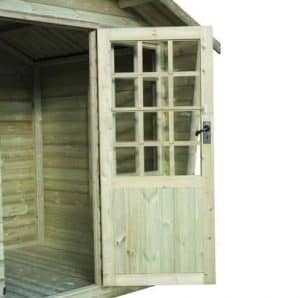 This is one of the most impressively made compact summerhouse we have seen and if you do not have a large garden, but you want the best quality and the most impressive summerhouse money can buy then this is the one for you, without question. 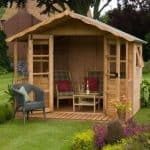 But as amazing as this is, as well made as it is and as good as the materials are, over a thousand pounds for a 6 x 8 summerhouse is a lot of money and we are sure that some of you may be wondering just how big a summerhouse, albeit a less high quality one, you could get for that same money.